🙃 - upside-down face - What does the upside-down face emoji mean? The upside-down face emoji, sometimes known as the upside-down smiley face, has several meanings depending on the context and personality of the user. It can indicate silliness, sarcasm, irony, passive aggression, or frustrated resignation. Outside of these, this emoji can be used for even still more ambiguous emotions. Closing at work just to open it right back up in a couple of hours. Since its inclusion in Unicode 8.0 in 2015, the upside-down face emoji has filled a gap in emoji users’ symbolic inventory. It can help to convey tones like sarcasm or silliness in written text, as well as to communicate confusion or irony. It’s often used in place of classic internet tone markers like /s and jk to indicate that a given statement has a hidden meaning, or is not to be taken seriously. The upside-down face emoji can convey sarcasm, passive aggression, or irony. It’s the visual opposite of the ordinary smiley emoji, which might lend to the interpretation that the meaning of the text is the opposite of what it seems. 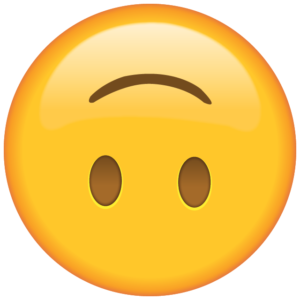 This emoji can also be used to communicate a comical level of misfortune, showing the user is “smiling through the pain.” In some contexts, there’s almost a palpable undercurrent of ugh or “why me?” associated with it. This emoji is for when someone is frustrated with their circumstances, but has to muscle through it anyway. In some cases, it’s used even for an emotion that can only be described as “this is fine,” à la a certain oft-referenced comic of a dog sitting in a burning room with a smile on his face. Additionally, this emoji is widely used to communicate goofiness or silliness. In other cases, it could even be used flirtatiously when paired with other emoji, such as a blushing face of some kind. Beyond these usages, the upside-down face emoji sometimes appears in contexts where the meaning is almost impossible to describe without the surrounding context. Yet, somehow, it works perfectly.